The NYC Diamond District - Should you purchase a diamond here? There are a staggering number of jewelers who’ve made their home in NYC’s infamous Diamond District, which is nestled in Midtown Manhattan on West 47th Street, between 5th and 6th Avenue . This pocket of New York City homes over 4000 diamond retailers and wholesalers, and collectively are responsible for $24b in sales each year. Each one of these retailers wants your buck –whether you’re a local, visiting the area, or even coming in from overseas. 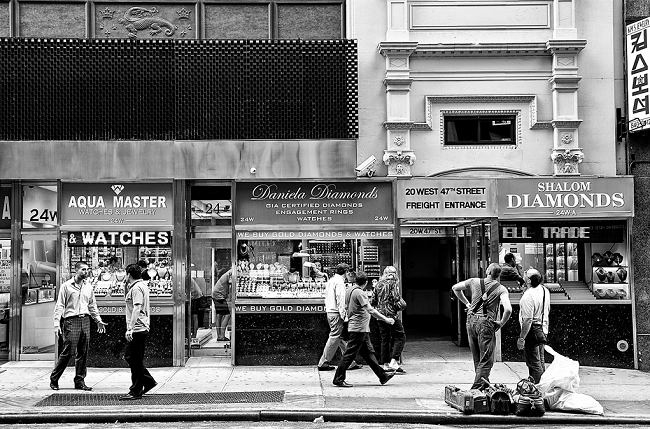 NYC has a strong history of being the gateway to America, and this is also true for diamonds. The vast majority of diamonds coming in to the US come in here. Shopping for diamond jewelry here is therefore an incredibly complex affair. Inevitably, with this size of market there is an overwhelming amount of competition for each sale. Unfortunately, this means that the unscrupulous trade alongside the reputable. How can you know that you’re getting a fair deal? Let’s take a look at the NYC Diamond District in more detail, and specifically, what you need to know. When visiting NYC you might be caught up in the spending hype that pervades the Big Apple. If this combines with a time that you’re looking for a diamond ring purchase, then you’re likely to be drawn to the Diamond District thinking it’s a great place to start, and hopefully, get a bargain. Unfortunately, this belief is misguided, and almost the opposite is true. In my experience, too many buyers get caught out here, and that’s only the ones who are aware they didn’t get the best deal. You see, the vast majority of customers heading through the doors of the Diamond District don’t actually know what they are looking at, and there are always those willing to take advantage of that. Whenever, and wherever, you are buying diamonds you need to do your homework on sites such as Your Diamond Guru. With diamonds, there are no bargains: Really, I cannot stress this enough. Diamonds are not like other consumer goods, you don’t get genuine ‘sales’ or cut prices. Therefore, if it seems like an amazing bargain, too good to be true, it’s almost certainly worth avoiding. Your weapon here is requesting a grading report from GIA (Gemological Institute of America) or AGS (American Gem Society) – if it doesn’t show up, steer clear. Take particular care if you’re choosing a colored diamond as there is a huge market for synthetically-colored options. Do your homework: I’ve said it already, but I’ll say it again! Please do a little research before you start your diamond hunt, wherever you are buying from. You need to be informed about some basics such as the 4C’s. Diamonds are large purchases; they are worth a small investment of your time. This is particularly true in the NYC Diamond District where the focus tends to be on sales at the expense of education. Do more homework: Now that you know the basics about diamonds, before you step foot inside a jewelers in NYC, you should take to the internet. Visit reputable retailers such as Whiteflash (if you’re looking for the highest quality cut), James Allen, and Blue Nile (if you want a large selection of more affordable diamonds) in order to get a feel for what you are doing. This will help you on many levels, including choosing the style, or perhaps the designer, or simply understanding more about diamond jewelry. It will also help you to compare prices more realistically. In fact, it’d be my preference if you stopped here and never set foot inside a NYC store, but instead protect yourself by buying online from one of these reputable jewelers – even if you’re not in reach of their actual stores. 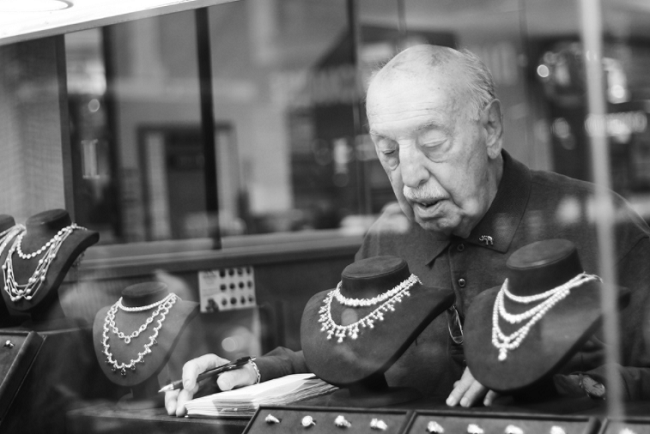 Take your time: No diamond retailer should be pressuring you to make a sale. Valuable diamonds and pieces of jewelry speak for themselves – they don’t need the hard sell. If you’re feeling pressured, back away. An excellent retailer will guide and inform, help you with styles and understanding, without the pressure. Examples of the hard sell might include enticements to buy there and then, special offers, or implying they have someone else interested. Ask questions, and judge by the answers whether a retailer is attempting the hard sell. Do not panic that you will miss out – the vast majority of NYC diamond retailers are actually selling the same pieces. Go next door, compare, and take your time. Compare like with like: Again, we come back to how much you know and understand about diamonds. In order to avoid pitfalls you need to be able to tell the difference between two diamonds that may look very similar to you. This brings us back to making sure you have access to a grading report from GIA or AGS. Avoid buying an item marked ‘wholesale’ – it’s another tool to get you thinking you’re getting a good deal. Check the paperwork: In addition to making sure you have access to a reputable grading report from a trustworthy source (GIA or AGS), make sure you are shown and given a copy of the returns policy, and a guarantee. This is another safety net. Reputable diamond retailers will sell at a fair price and have fantastic guarantees because they aren’t scamming you into paying over and above. In fact, some retailers go above and beyond, such as the Whiteflash who guarantee that they will ‘buy back’ diamonds during your lifetime if you’re wanting to upgrade. You particularly need to be aware of the difference between a return and a refund. If you are only offered a return then you need to walk away. This means you can return the piece, but you’ll be tied in to using the credit in the same store. If you’ve discovered you’ve been fleeced, you’re not going to want to do this. A refund however, is a return of your money in exchange for the return of the good. Stay Off the Street: As you can imagine, with 4000 retailers and wholesalers in one place, the competition between them is fierce. The result is that the enticements to get you in to a store often happen on the street itself. You need to have your wits about you, and know exactly where you are heading, rather than follow the hawkers. This again brings us back to it being preferable to buy online from a reputable retailer, in preference to taking potluck. Check, Check, and Check Again: An item of diamond jewelry is a big purchase, so take your time and check everything as many times as you need before purchasing. A reputable retailer will not pressure you, but instead assist you. If you do choose to make a diamond purchase within the NYC Diamond District then this is particularly important. Make sure the paperwork matches the actual item you’re buying, and, having checked the returns policy, get an independent third party appraisal soon after purchase. This won’t be necessary if you know you’re buying from a reputable retailer in advance, such as Whiteflash or perhaps James Allen as they are two of the leading diamond suppliers in the world. Consider how you pay: Lastly, as well as making sure you get a detailed receipt, it’s sensible to pay for such a large purchase on a credit card. Many of the dealers will push for cash, but I urge you to use a card. It adds another layer of protection to an expensive purchase. If I’ve painted a worrying picture above, it’s because you do need to be exceptionally careful when buying diamonds, but particularly in the NYC Diamond District. However, there are some purchases that are ‘safer’ than others. In reality, this means you should avoid diamond purchases (yes, in the diamond district! ), and opt for precious metals which can be easily compared for price by weight. Shopping for diamonds in NYC’s Diamond District may seem glamorous and romantic, but in reality, it can be anything but. While of course not every retailer is out for a fast buck, there are too many who are, to risk it. You will have a much more pleasurable – and safe – diamond buying experience if you choose one of the reputable online diamond retailers such as Whiteflash, James Allen, and Blue Nile.